By Sheila - USA - 24 Aug/03 - Viewed 1560 times. Our passage thru Honolulu airport went like lightening. Being at the front of the aircraft we were almost first off. Although we walked straight off the plane we were slightly irritated to find we had to take a coach to immigration. We needn't have worried. In no time we were having an in depth but pleasant interview with an immigration officer and by the time we were through our 4 cases were already on the carousel. We handed our customs forms to a smiling customs officer who wished John Happy Birthday for a few days time and we were free! There were plenty of taxis waiting and in less than an hour from touch down we were in our hotel room. 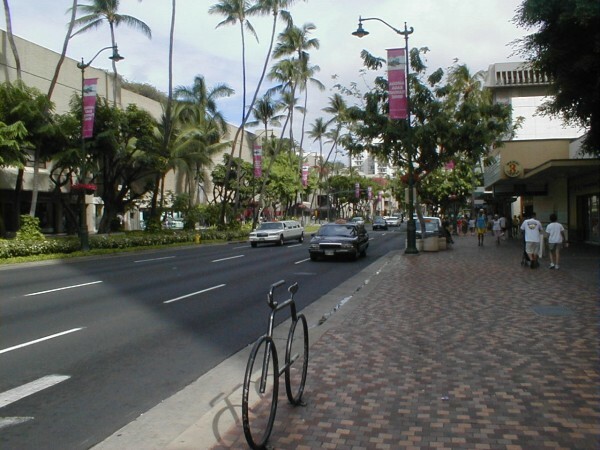 Honolulu is bustling. Like a mini America. We spent the morning on Waikiki beach watching the surfers. For lunch we fancied the sound of a Hot roast pork sandwich in a fast food restaurant but were surprised to find it consisted of mashed potato and slices of pork between 2 sheets of white bread smothered in gravy! With drinks and tax it came to 19 dollars for 2 which was almost as much as the Fish House and without the service and views. After lunch we meant to nap for an hour but the jet lag caught up with us and we slept thru till 18:15!